and woe unto them for all that they may have gained!" "God's Chosen ones, who come from Heavens, they have a bond of trading with their Jamaat. It is all about money, stupid! Mirza Ghulam A Qadiani - Prophet or Profit? Jamaat Ahmadiyya - Prophetic Movement or a Religious Trading Corporation? True Prophets of Allah encouraged their followers to spend in the way of Allah, to give alms and charity to the poor and needy but never ask anything for themselves in return for conveying the message of Allah. And there had been no exception to this rule, not in the history of Prophets of Allah. They had exemplary characters. However if you look at the history of false prophets and imposters it is all about money and worldly gains. In the present article I will try to show you how Mirza Ghulam Ahmad Qadiani and his Jamaat is no exception to this rule. Other religious leaders of various religions like mullahs, priests, pundits, rabbis may also be doing this trading but that is not the focus of this article, they never claimed to be Prophets. Prophets do not sell the Word of Allah. Those who do, are imposters and there is grave admonition in Holy Quran and other Holy Scriptures for such people. He receives revelation and considers them at par with Holy Quran and other Holy Books revealed to other Prophets of Allah. Mirza has never done anything or written anything except what has been transpired by God. God never leaves MGAQ with a mistake even for a blink of any eye. In other words there is no mistake in what he has written or what he has done. Before we look into Mirza Ghulam Ahmad Qadiani's conduct after he started claiming a divinely ordained status, it is better to look into his family background to understand why he longed for monetary benefits. He belonged to a landlord family who were loyal British subjects for generations. However the family earnings had been dwindling until the time of MGAQ it ceased completely. So money was always a source of worry for him. So now we know that Mirza wanted an easy life with easy money. Knowing the mentally of Indian Muslims, that wasn't a very difficult thing to do. All he had to do was to establish his credentials as a divinely-ordained religious personality and ignorant followers will do the rest. Indian Subcontinent was ruled by Muslims for 1000 years (that is how Mirza's great grandfather ended up in India). British usurped the power from the Muslims and with that came the onslaught of Christian and Hindu Missionaries. Mirza saw a chance to establish his credentials. He introduced himself as a servant of Islam and started challenging them for debates. What was the result of such debates is beyond the scope of this article, suffice to say that it made him famous and he started having a gathering, many of them ignorant villagers. As expected no one bothered to find out whether or not he ever succeeded in such debates, it was enough that their leader is challenging the enemies of Islam. He announced that he is an appointee of God and he is going to write a book called Braheen-e-Ahmadiyya in several volumes to prove the truthfulness of Islam. This was supposed to be a book of God, a collection of revelations (as announced by MGAQ later), yet Mirza had no qualms about selling it. But before we go into the MGAQ's enterprise, let us look at the socio-economic conditions of India during the late 19th Century to comprehend what price was he asking from people. MGAQ claimed that Braheen-e-Ahmadiyya is the word of God. Open Majmooa-e-Ishtihaaraat (Collection of Advertisements) vol.1 of MGAQ and you will discover that first 18 advertisements given during the years that he published 4 volumes of this book are concerning appeals to Muslims to donate money or seeking advance payment from prospective buyers. He constantly lamented about the lack of response from the Muslims. At one point he even criticized those who spend money on building mosques and not sending him money to publish this book. In December 1879 he raised the price to Rs.10 for the new buyers, although the book had still not been published. In 1880 he announced that for non-Muslims there won't be any discount in the price, they will be charged Rs.20 !! How can a person who earns a fraction of a rupee per day to feed his family pay Rs.5 for Braheen? Yet MGAQ seemed totally indifferent to the plight of ordinary man. He fixed the price of Rs.10 for ordinary Muslims and Rs.25 for non-Muslims. With an annual devaluation of 6-8% in currency, Rs.10 back in 1880 was equivalent to Rs.150,000 in 2008 and Rs.25 is same as Rs.375,000 today. Was he really trying to do a service to Islam and convey its truthfulness to non-Muslims!!! As the response of Muslims in purchasing this book was not according to MGAQ's expectations, with the passage of time his tone started changing. By the time he published 4th volume of Braheen-e-Ahmadiyya he had attracted a good gathering of affluent people and government employees, he was sure that there would be no problem in receiving FUTOOHAAT. He thus started writing other books and selling them. "Read this carefully as there is gladtidings in it for you. And so it went on and on for several years. Mirza had a good following by now and he was not satisfied with the petty gains he was making from his books. He wanted more FUTOOHAAT. He started the system of compulsory regular CHANDAS for his followers, demanded donation for the extension of his house, demanded donation for building the minaret and many more. The Indian famine of 1899–1900 (Imperial Gazetteer of India vol. III 1907 http://en.wikipedia.org/wiki/Indian_famine_of_1899â€“1900 ) killed 1.25 to 10 million people. It began with the failure of the summer monsoons in 1899 over West and Central India and, during the next year, affected an area of 476,000 square miles (1,230,000 km2) and a population of 59.5 million. The famine was acute in the Central Provinces and Berar, the Bombay Presidency, the minor province of Ajmer-Merwara, and the Hissar District of the Punjab; it also caused great distress in the princely states of the Rajputana Agency, the Central India Agency, Hyderabad and the Kathiawar Agency. In addition, small areas of the Bengal Presidency, the Madras Presidency and the North-Western Provinces were acutely afflicted by the famine. The population in many areas had barely recovered from The Famine of 1896–1897 ( http://en.wikipedia.org/wiki/Indian_famine_of_1896â??1897) . It was during this period when people were dying from hunger, this so-called Profit of God, totally oblivious of the suffering of starving masses, started making appeal for chanda (donation) for constructing Minarat-ul-Maseeh, in an attempt to apply Holy Prophet SAAW's prophecy on himself. Mirza Ghulam being an opportunist that he was, saw once again a golden opportunity to exploit this situation. He started saying that he had already published the prophecy in Braheen-e-Ahmadiyya some 20 years back regarding the Plague. Using fear as a weapon he tried to lay emphasis on his divinely-ordained status and linked this plague to his rejection as a prophet of God. He claimed that those who will accept him will be protected from plague and that God has promised to protect Qadian and more specifically his house from this disease. On this pretext he advertised for CHANDA to expand his house. Did Mirza trust God's promise and did God protect Qadian and people in his house? What did he do when cases appeared in his house? The details about the whole issue of Plague is dealt with in another article (http://alhafeez.org/rashid/fatwa27.html ), here I want to show that how Mirza used it to his advantage. Despite all these claims made by Mirza and his so-called revelation, Allah decided to humiliate this false claimant of prophethood. Not only those who accepted him became afflicted with Plague, those who were living in the safe-haven of Qadian and Mirzai Ark also developed the disease. And when someone in this so-called Noah's Ark got the plague, what was the conduct of this so-called prophet? However Mirza got what he wanted. He managed to get his house expanded. He did not feel ashamed that all his promises and revelations turn out to be false, rather he gave lame excuses. Yet Jamaat-e-Ahmadiyya raise the slogan of 'Love for All, Hatred for None'. If this is not hypocrisy, what is!! Shaikh Raheel Ahmad, a born former Ahmadi from Germany, labeled this as Jagga Tax. CHANDA AAM, It is obligatory for every Ahmadi to pay 6% of his earnings as Chanda Aam. Anyone who misses out on this, the balance will continue to be shown in his account and if he refuses to pay, he seizes to be an Ahmadi and is thrown out of the Jamaat. "There is great stress in the Jamaat on donations. Chanda Aam is that basic donation that is payable by every earning person (rather now it has become compulsory for unemployed persons as well to pay it), its payment is obligatory. Every employed person must compulsorily pay 6.25% of his salary as Chanda Aam. Round the year members' attention is drawn towards this task. Two three times a year inspectors come from the center and make sure the 100% collection of this donation. To facilitate its collection, many 'religious incentives' are given, that those who will make 100% payment, their names will be sent to 'Huzoor' (Mirza Tahir Ahmad Qadiani) for dua, and that at such and such times the names of Jamaat will also be mentioned etc. etc. Before the end of financial year, the leaders of the Jamaat give several sermons on the importance of this Chanda and to draw attention towards its collection; and at the end of the year, the details of this donation is announced, details of promises and next budget is announced. On every person, whether employed or unemployed, donation 'Tehreek Jadid' is compulsory. Earlier it was optional, but now gradually it has become obligatory. To make 100% collection of Chanda Tehreek Jadid, separate inspectors come from the center, leaders give separate sermons and the whole machinery of Jamaat gets busy in collecting this donation. 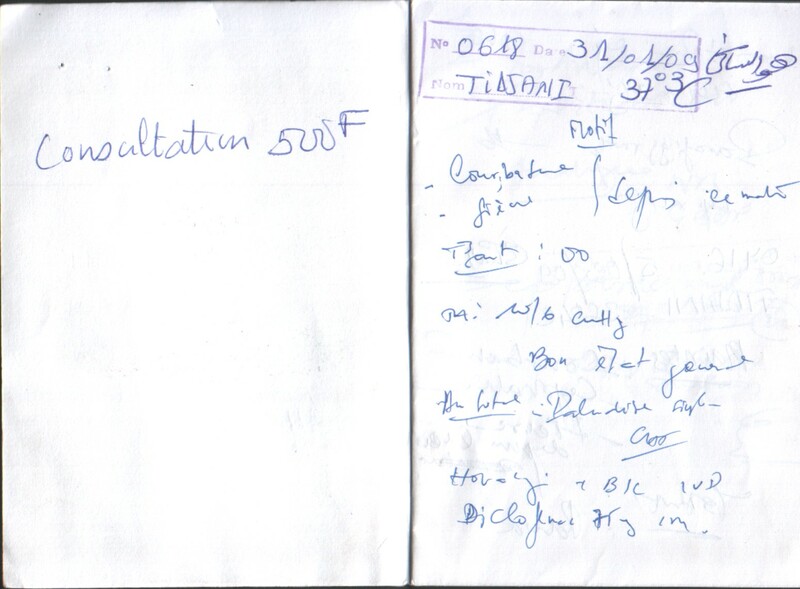 'Chanda Salana' is also a compulsory donation, which is taken annually at the rate of 10% of the monthly income. For its collection as well special sermons are delivered. 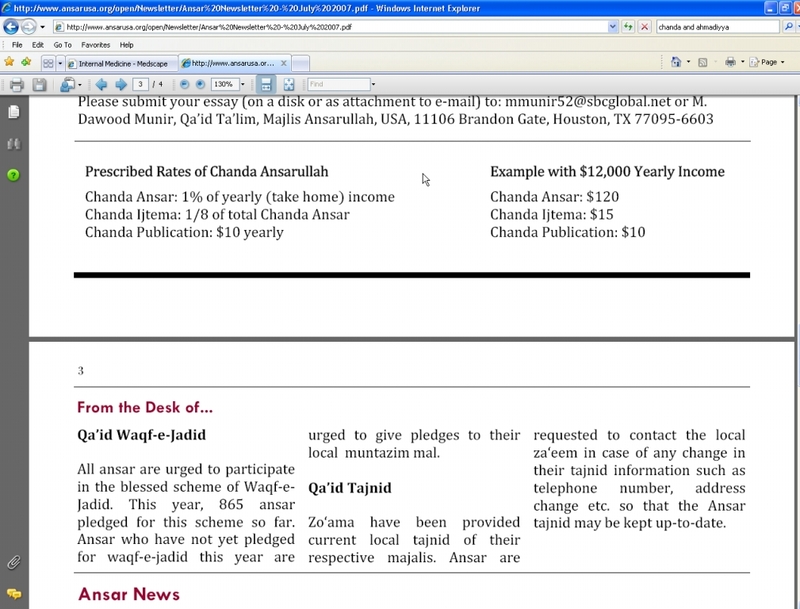 'Waqf Jadid' also was introduced as an optional Chanda but that is also now becoming an obligatory donation. The inspectors of above mentioned Chandas come from the center three times a year to make sure the collection of these Chandas. Those on whom the dues of these Chandas are outstanding, inspectors even approach their homes to collect the donations. On 24th December 1905 MGAQ published a pamphlet, Al-Waseeyat, in which he announced establishing a Heavenly Graveyard according to God's instructions and laid down certain conditions for getting buried in this graveyard. Although he wrote that the purpose of this necropolis is that only his sincere and pious followers will be buried in it, but actually it was another pretext to collect CHANDA. He and his family was exempted from these conditions, meaning exempted from being pious and donating chanda!!! The first condition was to give CHANDA and become what is now called a MUSI!!! Thus started the system of Waseeyat which over the successive generations of Khilafat has become a good source of income for the Mirzai Royal Family. Based on God's instructions/revelations the Heavenly Graveyard was located in Qadian but now there is a Heavenly Graveyard in Rabwa, Pakistan. Musis are spread all over the world, whether or not their dead bodies are taken to Qadian, who can tell. Dead persons do not come back to lay their claim. But one thing is certain. Immediately after the death of a MUSI, Anjuman entrusted with the Waseeyat Fund takes over the assets of dead person. In every gathering Ahmadis are encouraged to become a MUSI. All funds collected thus are added to the coffers of Khalifa. ".. this incident spans over 50-60 years. One of my elderly lady relative, Maryam Begum, did a waseeyat (became a MUSI). She was living in a small village. There was some dispute between ladies on some small matter and one woman complained about my elderly relative. The department of Waseeyat put this complaint in the file, but continued to receive the monthly CHANDA for WASEEYAT. Approximately 50 years later she died. When she was brought to Rabwa for burial, her file was opened and the letter was found, and they said she cannot be buried in Heavenly Graveyard. When inquired about the reason, they said Old letter...... I ask the Khalifa Saheb Mirza Masroor Saheb respectfully when a letter was filed in her file 50 years ago, was it not the duty of Department of Waseeyat to inform her, but they did not do that and they kept receiving the CHANDA WASEEYAT. This lady was a very sincere Ahmadi. Neither her Chanda was returned nor she could buried in Heavenly Graveyard. Her sons were on good Government posts. Her elder son, Major Dr. Abdul Ghafoor Zahid immediately cancelled his Waseeyat and later the younger son also did the same." "..ever since we became old enough we have heard only of Jamaat's Tahreeks (Appeal for various Chandas), every Khalifa has brought some new Tahreek. Whenever you attend some marriage gathering or on someone's death, their (Jamaat's) representatives are present there and keep repeating about WASEEYAT. Whatever has been collected over the last 100 years should be used to help deserving people ...... what kind of a religion is this that the sword of money is always hanging (on our heads). If you pay a little attention there are nearly 50 CHANDAS. Are chanda part of tenets of Islam? They don't make appeal for ZAKAAT openly..."
"Unless we raise our voice in unison this oppression will continue and the treasure chest of MIRZAI (ROYAL) FAMILY will continue filling and we will continue to be crushed by this oppression. For God sake come out of this swamp." 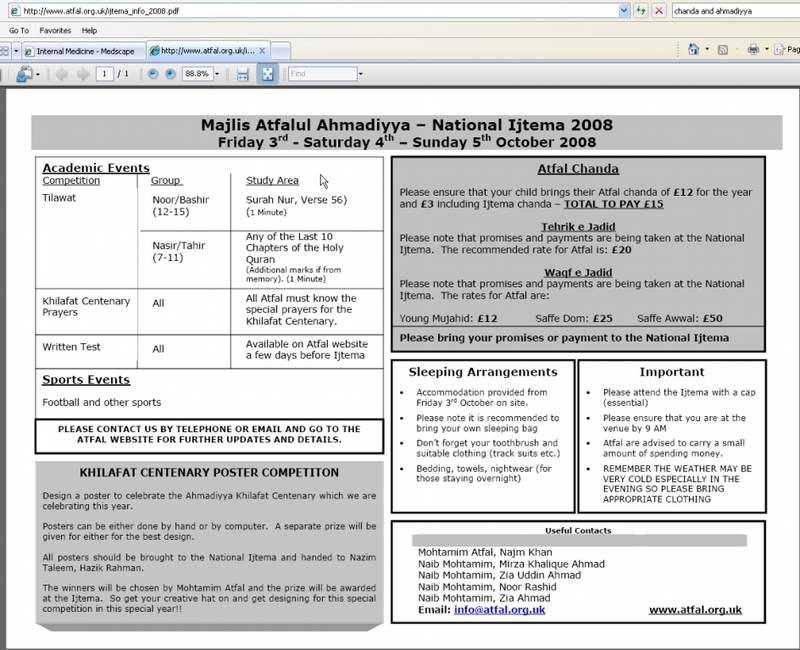 Click here for current Waseeyat Form used by Jamaat in Canada. "....and I want that this arrangement should be such that I am relieved of this nuisance of Langerkhana and get busy in my work...."
What a doubletalk! On the one hand talking of Blessings and Mercy of Allah, Tawakkul on Allah and then asking people to give Chanda! It seems that MGAQ had lost faith in God that He will make any further arrangements!!! True Prophets of Allah give us news conveyed to them by Allah by way of Wahi (revelation). MGAQ although claimed that whatever he says or writes is from God, yet while writing the book, Maseeh Hindustan Mein, tried to gather information from various sources. He therefore arranged two parties to go to Afghanistan and to Nassebain (a town near Syrian border) to gather some proof. And as usual he asked his followers to give some Chanda to cover the travel expanses of these parties. In 1901 MGAQ decided to start an English magazine which will print his articles. He suggested that there should be some permanent funding of such a magazine, some partners who would invest in this scheme like a business and the money should be kept in a bank. Interestingly he wrote that he would have nothing to do with this fund, probably he realised that by now many people are whispering about his unending ads for CHANDA. This business proposal soon became an appeal for another Chanda!! "Read this carefully as there is gladtidings in it for you. To, The Rulers, Noblemen, Well-to-do People, Government and Highly Placed Officials!! There are many such letters from MGAQ to Seth Abdur Rehman, in every letter he acknowledges the receipt of cash, giving him the good news of God acknowledging his CHANDA even before it reached MGAQ, giving him lots of blessings and prayers for the increase of his business and finally asking for more CHANDA. There are many more such devotees who were conned in similar manner. Mirza Ghulam Ahmad Qadiani had been notorious in publicizing himself in newspapers. In the beginning when he pretended to be a servant of Islam, he was challenging opponents of Islam in a provocative manner. Later he used the same tactic to confront his opponents. His methodology was unique. I am not aware of any Divinely ordained person or a scholar of any caliber to put a wager on their writings or claims or statements. It reflected his own mentality that money was very high on his mind. He was however astute enough to put such conditions that he would not loose money. Thus he was responsible for opening a door for followers of other faiths to write against Quran and Holy Prophet SAAW!!! 1 Curse 2 Curse 3 Curse 4 Curse 5 Curse 6 Curse 7 Curse 8 Curse 9 Curse 10 Curse"
Wow!! What rage! Is this really behavior of a Chosen one of Allah! I think the thing that hurt his ego most and annoyed him was his allegation that Mirza does not have any money or property!. You can fool some people some of the time but you can't fool all the people all the time. Sure enough, not all people in his Jamaat were blinded by devoted ignorance and they started noticing things and started raising their voice and concerns about MGAQ's money handling. This is the worst thing that can happen to any claimant of divinely ordained status. His own diehard supporters started doubting his integrity. He preaches his followers to lead a simple life, make sacrifices and have faith in Allah but in his own life he was not practicing what he preached and that irked some of his educated followers as the following examples show. Dr. Abdul Hakeem was an devoted follower of MGAQ but ultimately he denounced MGAQ as an imposter. Isn't it strange that on the one hand MGAQ had been advising his followers to make sacrifices and lead simple life, people were selling jewelries of their wives to make 'Financial Sacrifices', to give CHANDA, and on the other hand Mirza Ghulam was able to purchase land and make Jewelry worth Rs.2000, which is equivalent to 15,000 X 2000 = Rs.30,000,000 !!! Let this be an eye opener for his followers. What you sow, so you reap. Read the following examples. This was probably the only exception in the hierarchy of Ahmadiyya Movement who had made large contributions for various projects during the life of MGAQ and after he became the Khalifa. There is no record that members of the Qadiani Royal Family including the 2nd, 3rd, 4th and 5th Khalifa and others made any donations of CHANDA towards any Tehriks or projects. As mentioned above, MGAQ had even exempted his family from giving anything for burial in Heavenly Graveyard. He was a Waqif Zindagi. In Ahmadiyya terminology this is the person who has dedicated his life under Tehrik-e-Jadid scheme for the Jamaat and is not allowed any other profitable activity and has to live within their meager allowance paid by Anjuman Tehrik-e-Jadid). According to his own version (A man of God), as a child he sometimes did not have a clean shirt to wear so had to go to school, clad in a Sherwani (full coat) over his bare torso and as a married man working in Rabwah, he could not afford to keep a car so moved about on a bicycle. Yet even before he became Khalifa he became the owner of three Western style cottages (all fixtures and fittings imported; complete with lawns and a swimming pool) in Ahmad Nagar, a Textile Factory (Towels, laces and tapes etc) in Korangi, Karachi, Tahirabad Housing Colony near Rabwah, a commercial Swimming pool in Rabwah etc. All this BEFORE he became a Khalifa. As a Khalifa, what about the flats HE purchased in the name of his domestic servants in London which were used to accommodate asylum seeker Ahmadis, not for free but by renting them to the Local Council. All this formed part of the trust he made before his death, the income from the trust to be shared by his daughters. According to reliable sources from London, the inheritance left by Mirza Tahir Ahmadi for his daughters exceeded eight million pounds in value. The system of Chandajaat, there are 35 CHANDAS, we have been burdened too much by them. Using intimidation and force Murabbis receive them from us, and in case of default in the payment they threaten us with various restrictions and ex-communication from Jamaat; and we are told that our faith has weakened. May Allah reward Brother Mushtaq for his efforts, May Allah show him, all Ahmadis and all of us, truth as truth and taufique to follow it, and show falsehood as falsehood and hidayah to stay away from it. Ameen. Mirza Mubarak (another member of Ahmadiyya Royal Family), was the Head of the Foreign Missions with Tehrik-e-Jadid and used to travel (First Class) worldwide (during summer months) to "INSPECT" Ahmadiyya Missions abroad. On one occasion (it may be his standard practice but I am a witness to this occasion only) he sent his instructions to the Imam of London Mosque to book a SUITE for him and his wife in a 5 star hotel in Brighton AND THIS MUST BE OVERLOOKING THE SEA. What happened then is another story but one thing is worth mentioning that he did not visit the London Mosque (Mission) even once. He summoned the Imam and Deputy Imam (separately) there for his INSPECTION. 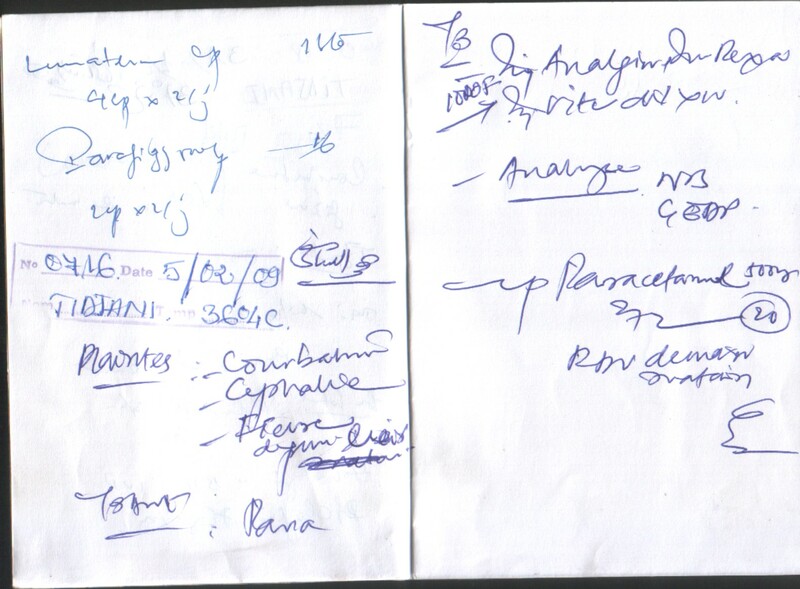 Some examples of present day CHANDA SYSTEM are given here which has become much more organized now. 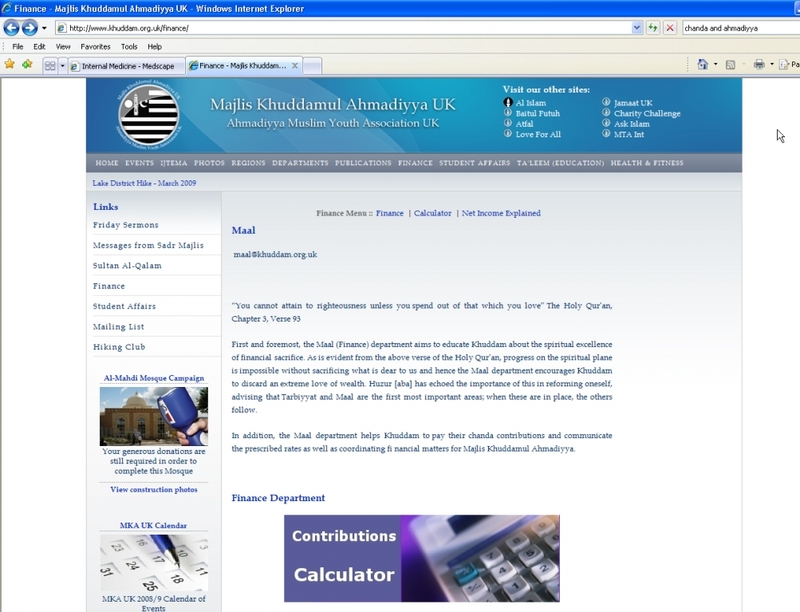 On Khuddam-ul-Ahmadiyya UK website above, there is a calculator given to calculate the CHANDA on net income. 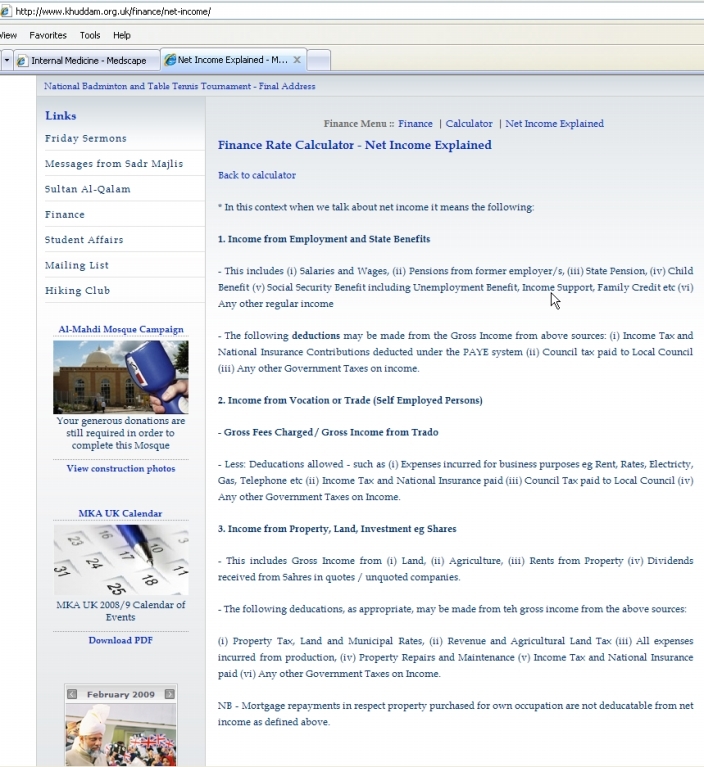 Net income is explained on another page. Jamaat Ahmadiyya is registered in many countries as non-profit charity organisation and as such it is entitled to collect donations and receive funds which are exempted from local taxes. The details of it UK for instance can be found at http://www.charity-commission.gov.uk/. 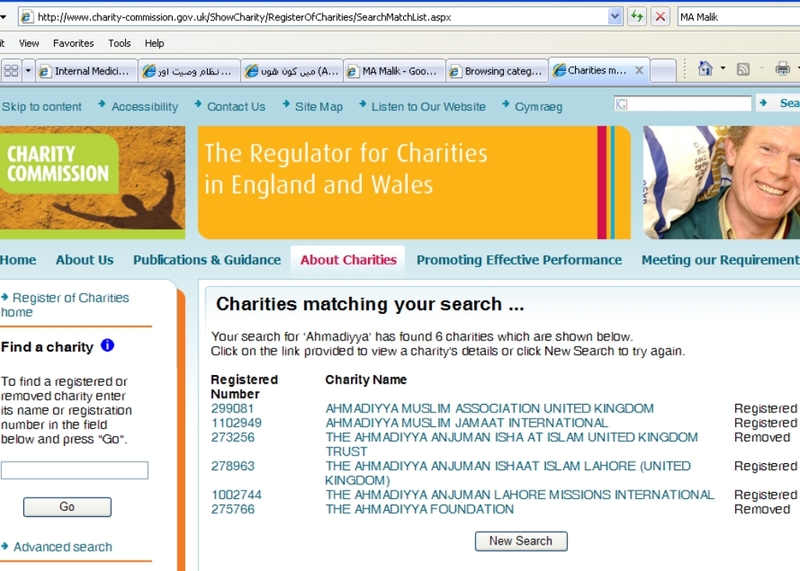 Type Ahmadiyya in the search box and you will get Jamaat Ahmadiyya registered as charity. 1. 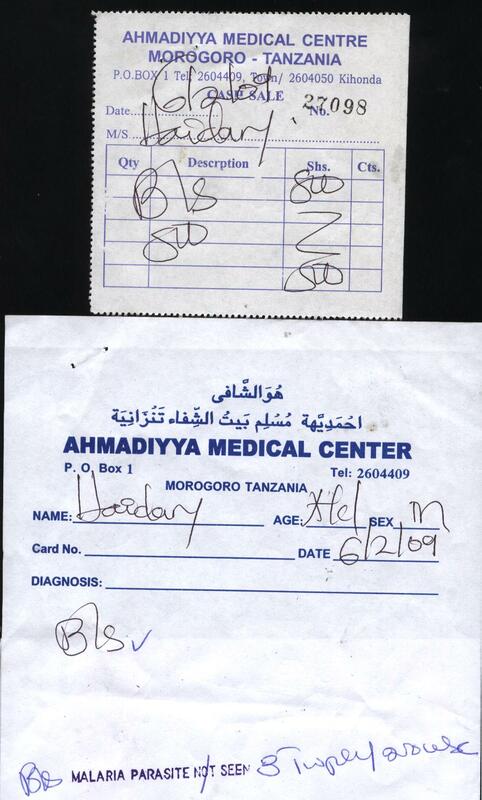 Ahmadiyya Medical Centre in Tanzania is charging Shs 800 for doing a blood test for Malaria. 2. 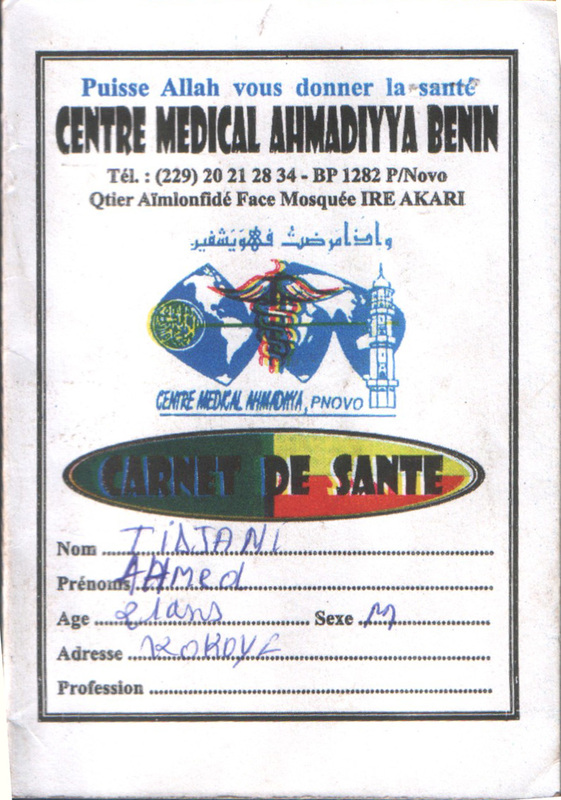 Ahmadiyya Clinic in Kinshasa, Republic of Congo is charging Congolese Fr 2000 for consultation and Fr 1000 for Laboratory test. In Tanzania Clinics of Ahmadiyya Jamaat impose fees for all people including members of their sect except their preachers. Comparing to other private clinics in Morogoro, where one of their clinics is located, they charge for Malaria test 800 Tsh while other clinics charge 400 Tsh. 1 kg of beans in Morogoro costs 600 - 900 Tsh. Many are unemployed and the majority of people are living in miserable conditions with 1 USD/day around 1,300 Tsh today. In BENIN their clinic is used for publicity and as a business centre. They charge 500 CFA Francs for a clinic card which allows them to have free consultation but patient must pay for medicines and tests. 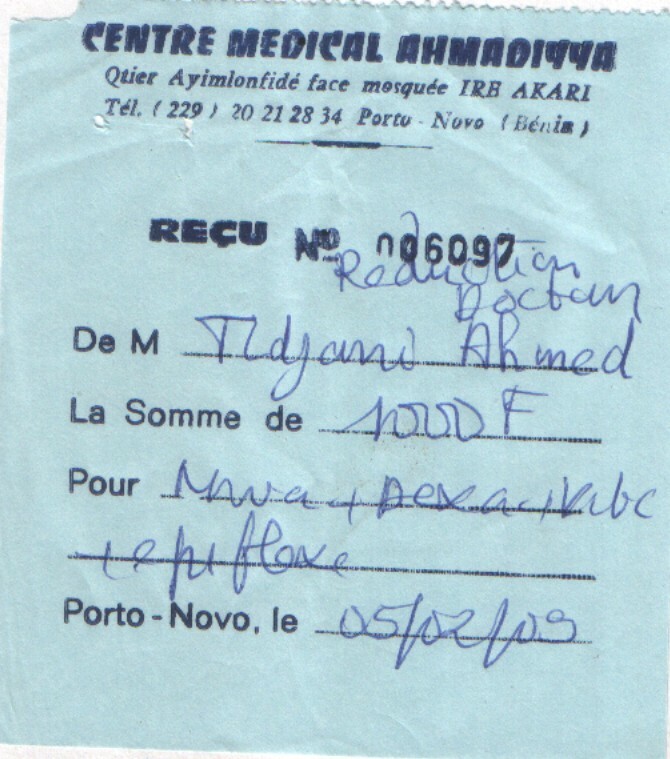 Republic Democratic of Congo Ahmadiyya clinic charges in Kinshasa 2,500 Congolese Francs (3.5 USD) for consultation and 500 Cfrs for test. Many are unemployed and the salary for a door-keeper is fixed between 50 - 100 USD/month. 1 kg of rice costs 1 USD and 1 kg of beans costs 2 USD whereas 1 USD = 720 Cfrancs today. Many families are not able to pay clinic charges and school fees for their children. According to my sources in Kinshasa (Congo) there is no free treatment for poor. No money no treatment. Ahmadiyya Mosque in Calgary, Canada, was inaugurated with great pomp and show by the 5th Khalifa, Mirza Masroor on 5th July 2008. As is the usual practice of Jamaat, present at the inauguration was the Prime Minister of Canada, Mr. Stephen Harper who was joined at the opening by several federal and provincial politicians, including Liberal Leader Stéphane Dion. Its website http://www.baitunnur.org/ says that it is one of the largest mosques in North America which has been completed through individual donations of Ahmadiyya Muslim Community. Some people sold their houses to give CHANDA for the mosque. Ahmadis were proud that Prime Minister Harper was full of praise for them. Several Newspapers published articles on it. However all is not well and there is more than what meets the eye. According to newspaper reports from Canada (Calgary Sun and Calgary Herald) EllisDon Construction Services Inc. has filed a nearly $5-million lawsuit against Ahmadiyya Muslim Jama'at Canada Inc. It seems that Jamaat Ahmadiyya Canada had not paid them fully for the construction cost. The construction company says it entered into a written contract in June 2006 to build the 45,000-square foot Ahmadiyya Muslim Mosque, completed in late August this year, and that the contract was breached. Naseer Ahmad, an employee or agent of Ahmadiyya also named as a defendant, is alleged to have interfered with EllisDon's contractual and economic interests with an an intent to damage its reputation. EllisDon alleges he "encouraged subcontractors to reduce their billings on the project and to make up the reductions on other projects; issued instructions directly to subcontractors to carry out additional work then refused to pay for the work; advised contractors that delays in payments arose from the contractor's incompetence or misconduct; and attempted to persuade the project consultant to rescind approvals and certificates of payments that had already been issued. If the dues are not cleared, then the court may decide to sell the property to pay the dues. Question is what happened to all the CHANDA given by the Ahmadis? Who misappropriated the CHANDA collected? There are rumours about some high officials in the Jamaat of Canada using that money in stock market and loosing badly. Members of the Jamaat in Canada are rightly worried that they will be asked to make more CHANDA now! Officials of Jamaat Ahmadiyya Canada has of course denied these allegations leveled by the contractors and have in return accused them of doing sub-standard work. Who was suppose to supervise this work? Why this issue of sub-standard work was not raised before inauguration? Why Jamaat waited until after the lawsuit was filed against it by the construction company to raise the issue of sub-standard construction? Perhaps these questions will be answered only through the court proceedings. One wonders what else is going on with other such construction projects of Jamaat Ahmadiyya especially in Africa. Who knows! Kismat200 writes on Ahmedi.org about the present day Public Kitchen in the Seat of Khilafat, Ahmadiyya Headquarter in London. Have any one know why Jamaat waste so much over money on food, Where they need to cook food for !0 people they cook for 30 peoples, They waste poor people money. In London Mosque and Morden mosque they waste so much money. The incharge of Kitchen in London Mr. Kahkor is making good money doing private shaadi (marriage) parties, he charges people for food and cooking and uses Mosque facilities, gas and food to do that. Mr Kahkoor and his Brother in law are suppliers of food and run the kitchen for Jamaat. They make good money in that too. Mr. Kahkoor's brother in law is asylum seeker and will stay in London for 6 months, receive public assistance and make money and then go back for 3 months and work. Can anyone can explain us how this Jamaat is honest here. They never check where all this money go out. Why family and asylum seekers make money? I will be honest here this is really bad to make money on food and (5th Khalifa) Masroor and Jamaat never look in this matter. Amir Jamaat is also part of commission which I hear he gets from food supply. (5th Khalifa) Masroor and Jamaat is quite because they are loaded with big money issue and Mr. kahoor is busy in kitchen to make money, What a nice and good Jamaat and Ahmadi you all are... no need to look out side.. and and look in your kitchen. I have presented you the facts here. If you do not want to believe what has been written above because your Jamaat murrabbis will tell you that I have quoted out of context, go and do your own research. More and more new generation of Ahmadis are raising their voices about this extortion and corruption One can find more details on various online websites. I recommend this website http://www.ahmedi.org which exposes the fraud of present day Jamaat with a lot of inside information from all over the world.